Here are some of the places and individuals you need to notify after the death of your spouse. There is no order in who to contact first. Don't forget notifying extended and distant family members and friends, too. If you are feeling very overwhelmed, you can avoid hurting others' feelings by asking someone else to do this for you. · Social Security Administration - 1-800-772-1213. Do not cash any checks received for the month in which your spouse died or thereafter. They need to be returned to the SSA. If Social Security benefits were received via direct deposit, you will need to notify your bank also. You also need to check on survivor benefits for both yourself and your children. 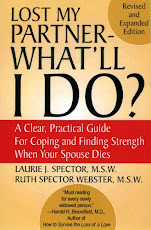 · Dept of Veteran Affairs if spouse was in the military for burial and memorial benefits. If you’re facing a Thanksgiving dinner that might be hindered by a bad case of heartburn or having to cope with troublesome relatives, consider what the original Pilgrims had to cope with. Especially the widowed survivors. For a look back, we discovered the informative article, Pilgrim Burials on the site http://www.lovetoknow.com/. The authors go on to describe later Pilgrim burials, “When Pilgrims died, headstones were not erected at the burial site. No artisans skilled in carving stone had come over with the first group of settlers. In addition, there was no stone available in the area where the Pilgrims settled from which to fashion a monument to the dead. Their first priority was to concentrate on the tasks necessary for survival; even if the stone carvers had come on the trip, there wasn't any time to carve headstones. Redmond and Adomaitis describe burial rituals, “In the early years after the arrival of the Pilgrims in North America, funerals were a very simple matter. No funeral ceremony was conducted and no special sermon was given. The grieving family did not wear mourning clothes for a certain time after the death. So enjoy the food and be grateful that as difficult as some relatives can be, at least you aren’t stuck with them for all eternity. If you were the widow of a revolutionary war veteran, you had better stick around a long, long time if you hoped to collect on your husband’s government pension. July 24, 1836: Widows were authorized the pension that would have been available to their veteran husbands when they were living, so long as they had married before he left service. July 7, 1838: Widows who had married Revolutionary War veterans prior to January 1, 1794 were authorized a five-year pension. July 29, 1848: Widows were authorized a pension for life if they could prove they had married the veteran prior to January 2, 1800. February 3, 1853: All widows of Revolutionary War veterans, regardless of their date of marriage, were made eligible for a pension. March 9, 1878: The final Revolutionary War pension act authorized pensions for widows of veterans who had served at least fourteen days or had participated in any engagement. Imagine being one of the widows who was finally able to collect benefits almost 100 years after the Revolutionary War! Gives new meaning to the term "May-December Romance", doesn't it? In our last post, we suggested the best ways to cope with the upcoming holiday season. 1) Contact the host or hostess before the get-together and let them know that you aren’t feeling like your usual self and may need to leave early. If you’ve recently lost your spouse, the coming festivities can feel as unwelcome as Marley’s Ghost. 1) Think ahead and try to anticipate how you’ll feel on each holiday. 2) Even if you don’t join in the festivities, don’t remain alone all day. Spend some time with a friend. 3) Considering your loss, don’t expect yourself to be as upbeat as usual. Expect some sadness as you take part in the festivities. 4) To lessen the chance of emotional sneak attacks, make some time to grieve, either on the holiday or just before it. 5) If you do choose to join in holiday activities, make some changes as to how much you do or become involved in. Look for more tips in our next post. 1) Listen to what you know instead of what you fear. 2) Nothing in life is to be feared, it is only to be understood. 3) Of all the liars in the world, sometimes the worst are your own fears. 5) You can discover what your enemy fears most by observing the means he uses to frighten you.